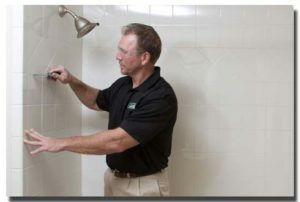 Regrouting services are offered through the professionals at The Grout Medic. Showers and countertops that have tiled surfaces often develop missing, discolored, or damaged grout. By regrouting the surface it can look brand new again. The Grout Medic will remove the old grout and replace it, giving the surface a new appearance that is elegant. Not only will the surface look brand new, but there will be an extended life added to the surface, as well. After regrouting services are performed, you will be able to experience the room for a longer period of time because it is going to create a water tight area that can extend the life of the newly regrouted areas for many years. Health benefits also come with regrouting. By getting rid of all mold, dirt, mildew, and other substances, you are going to be avoiding what could turn into severe respiratory issues. You will also not need to use any harsh chemicals that you would typically use to get rid of difficult mold. nstead of wasting time and money trying to re-tile the entire surface, regrouting services dramatically improve the appearance as if you had replaced the tile. By using professional tools, a technician will remove the grout from around the tiles and then will place new grout in between the tiles. You can regrout your shower, bathroom, kitchen counters, floors, balconies, and fireplaces or anywhere else that has tile within your home. You will notice the convenience and the lower cost of regrouting. The Grout Medic will remove the old grout and replace it in most cases within one day, with the surface typically ready for use the next day. You will notice how clean and new your tile and your grout look after you have the area regrouted. Feel comfortable with all rooms in your home by keeping the space clean and like new. For more information about our professional regrouting services in your area, contact us today.